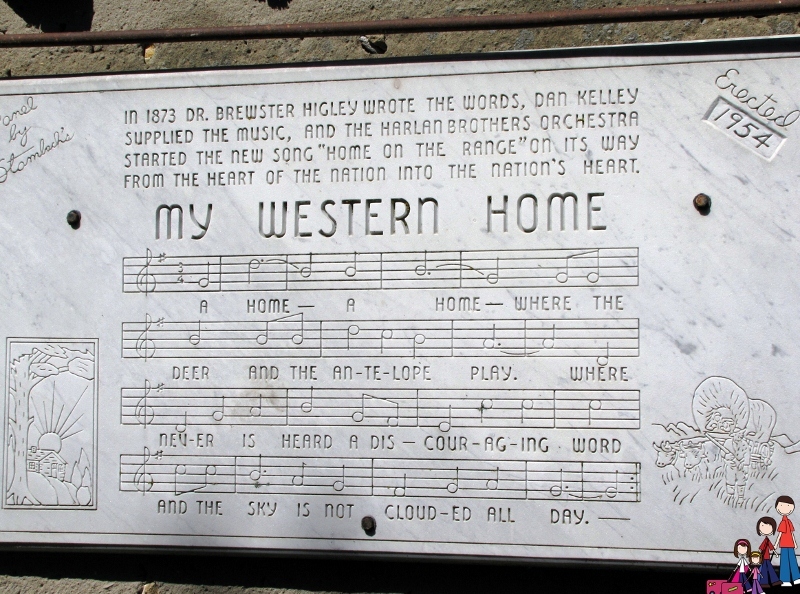 “Home on the Range” is an iconic song of the United States. Within its words you are transported to a vast open land, free from skyscrapers, and filled with frolicking animals. It’s words are known the world over and has been recorded by greats such as Sting, Frank Sinatra, Bing Crosby, Alvin and the Chipmunks… I seem to recall Bugs Bunny singing it and adding his own bit (…and the rabbits). And while there are few that haven’t heard this song, there are very few that know the cabin in which it was written in 1871 still stands today in Smith County, Kansas near the town of Athol. A stop at the Higley Cabin was a must during our Kansas roadtrip as Dr. Brewster Higly is an ancestor of my family’s. Dr. Brewster Higley seems an unlikely man to have had such poetic words (see the full song lyrics) spill forth. He had lost three wives to death and a forth to divorce before moving to Kansas and staking claim to a piece of land along West Beaver Creek as part of the Homestead Act of 1862. The poem, written for himself and titled “My Western Home”, was tucked inside a book and forgotten until it was found in 1873 by Trube Reece who had brought a man to Dr. Brewster to be treated for a gunshot wound. Waiting, Mr. Reece opened a book and the poem fluttered to the floor. At the urging of Mr. Reece, Dr. Higley allowed the poem to be printed in the Smith County Pioneer in 1873 and the Kirwin Chief in 1874. 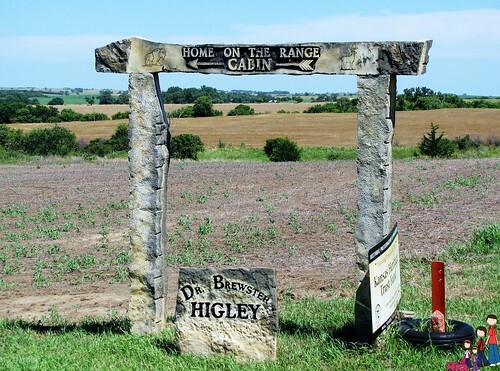 The poem was set to music in 1873 by Dan Kelly and was performed publicly by Judge John Harlan and his family who added the refrain, “Home, home on the range…”, and thus creating the song we all now know as “Home on the Range”. The Higley Cabin is not near anything, really. I imagine Dr. Higley liked it that way. It is 9 miles north of US-36 (or 16 miles south of Franklin, NE) on K-8. A carved limestone sign points you to your destination, another mile to the west. To eyes used to large houses and spacious buildings the Higley Cabin is very tiny. The building was, amazingly, never torn down and stands today, much similar to how it looked when Dr. Higley built it. A simple building of native trees and stone, it most likely had a loft at one time and the fireplace was removed, the stones used elsewhere, when it was no longer used as a home. Years after Dr. Higley’s death claims were made by an Arizona couple that the now popular “Home on the Range” was written by them. A New York lawyer was assigned to investigate the claim which took him on “a three-months’ tour of nearly every state west of the Mississippi” and eventually led him to Smith County, Kansas. When the site was legally proven to have been homesteaded by Dr. Higley and the cabin to have been constructed by him the land was owned by Mr. and Mrs. Pete Rust. 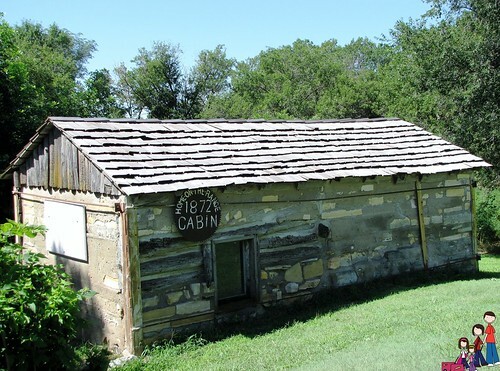 They were twice offered large sums of money for the cabin (once by Pioneer Village in nearby Minden, NE) but chose, instead, to maintain the cabin, leaving it in its rightful place in American history. The Ellen Rust Living Trust owns the Higley Cabin and is responsible for restoration and maintenance of this National Historic Site. The trustees are committed to restoring and maintaining the cabin. For more information on the Ellen Rust Living Trust or if you would like to schedule a visit contact El Dean Holthus (phone: 785-695-2347 ; email). Special thanks to El Dean for taking the time to meet my family and talk with us about the cabin and its history. To hear about upcoming restoration projects, please watch the short clip below. This article from the Wichita Eagle came out just a couple days after I published this article. It has a bit more Higley Cabin history for you. If you’re already rambling about north central Kansas you’ll want to make a quick stop at the geographical center of the contiguous United States near Lebanon, Kansas (about 15 minutes east of Athol). The site, located a mile off US Route 281 at the intersection of K-191 and AA is endearingly unassuming. 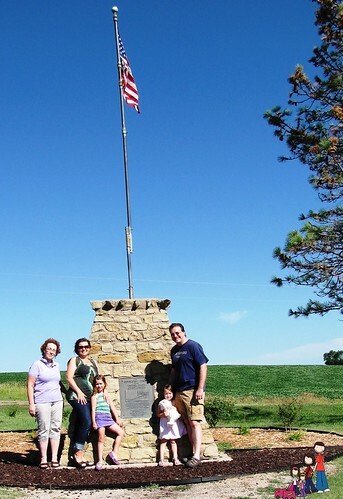 A stone marker, American flag flying from the top, marks the spot. A few picnic tables rest under a shelter and a tiny four pew chapel is available for travelers to give their thanks- or for those looking for a truly unique (and small) destination wedding. When we visited I was surprised to find the spot rather busy. A few bikers were there, leather clad in the 100 degree heat, as was a man who was cycling from Denver to Nashville to raise funds for cancer research, and a couple who seemed to be buskers preparing to perform for whoever stopped by. Unless you bring a picnic there isn’t much to do here, but don’t let that deter you. 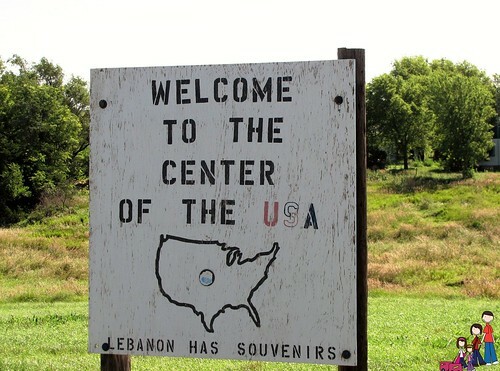 There is only one center of the United States… You’ll want to get a souvenir photo.